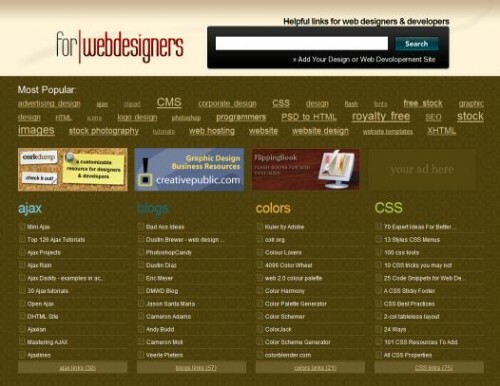 ForWebdesigners.com is a popular web designers and developers resource. It not only offers user submitted links and ratings, but the site also offers a unique search component where designers and/or developers can advertise their website for a (user-defined) monthly cost. With their auto-budgeting system, advertisers set a monthly budget and only pay when they get traffic. Checkout ForWebdesigners.com, and let me know if you find it useful. Also, if you find any other useful websites out there, please contact me! Thanks! It has a lot of resources to learn. Maybe you could recommend a website which has extensive tutorials on how to convert normal tempates to wordpress themes?